So, you've booked a booth at the congress and you've got your registration discount code from the email sent to you by [email protected] under the subject: MSACL 2018 EU: Exhibitor Logistics Reference. Now it's time to get your people registered, or show them how to do it themselves. This guide will help get you started. NOTE: There is also guidance available for Managing Your Registration, if needed. (1) Click the link to the registration page: Register Now! If you are registering for someone else, please be sure to use THEIR email address when you register. The same email address cannot be used to register more than once for each congress. Fill-in your personal data. Note that attendee badges at the congress will be compatible with the BadgerScan lead collector, a completely free and private app (i.e., your contacts are yours alone). You can enter a limited or extensive amount of information on this page -- it will be encoded in your BadgerScan QRcode that anyone can scan and collect quickly and privately. 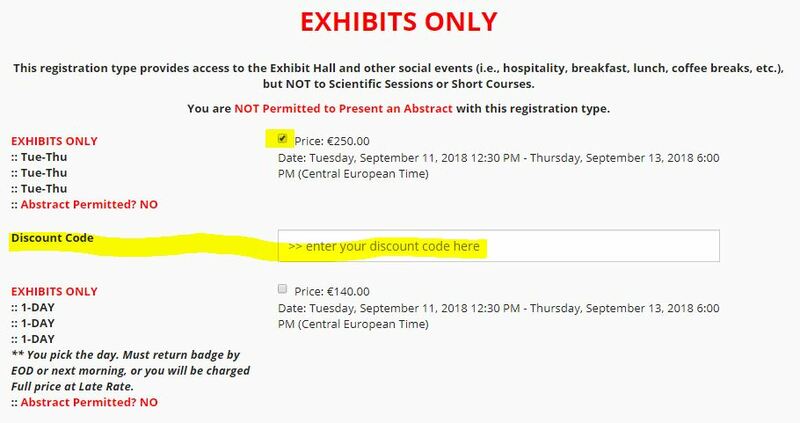 Under Exhibits Only, (a) check the box that correlates to the Tue-Thu registration, and (b) enter your discount code^ in the highlighted box. ^ - you should have received it in an email from [email protected]; if you booked a booth and did not receive that email, contact me. You can use this same discount code for up to four Exhibits Only registrations. Each exhibiting vendor is eligible for one comped Printed Program. If you are the one who will be collecting the program, click the box for the Printed Program and enter the SAME discount code as above. Once you click your mouse outside the discount code box, the charge for the program should go to EUR 0. You can also register for short courses during this registration process, if of interest. Please contact Chris Herold at [email protected] or +1-858-922-5813.